The ZenBio ORAC (Oxygen Radical Absorbance Capacity) Antioxidant Assay Kit can be used to determine the total antioxidant capacity of biological fluids, cells, and tissue. It can also be used to assay the antioxidant activity of naturally occurring or synthetic compounds for use as dietary supplements, topical protection, and therapeutics. The assay measures the loss of fluorescein fluorescence over time due to peroxyl-radical formation by the breakdown of AAPH (2,2'-azobis-2-methyl-propanimidamide, dihydrochloride). Trolox [6-Hydroxy-2,5,7,8-tetramethylchroman-2-carboxylic acid], a water soluble vitamin E analog, serves as a positive control inhibiting fluorescein decay in a dose dependent manner. 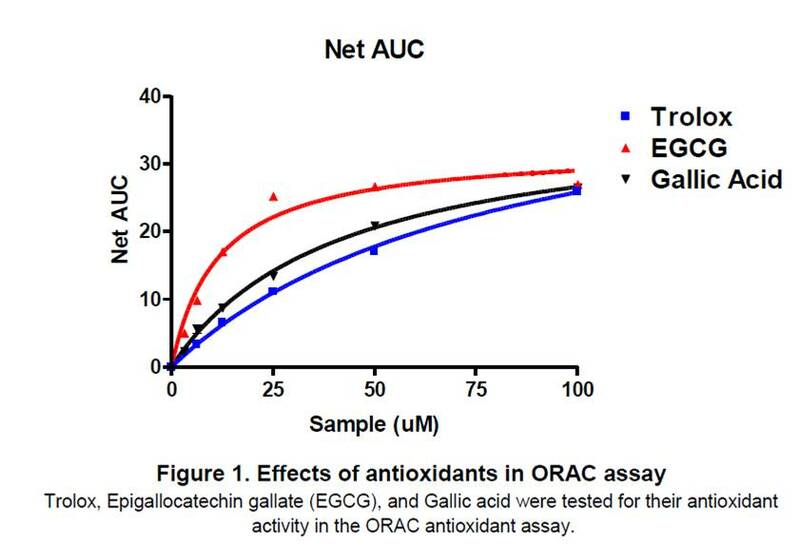 The ORAC assay is a kinetic assay measuring fluroescein decay and antioxidant protection over time. The antioxidant activity in biological fluids, cells, tissues, and natural extracts can be normalized to equivalent Trolox units to quantify the composite antioxidant activity present. This assay measures antioxidant activity by hydrogen atom transfer and when combined with ZenBio's ABTS antioxidant assay kit, provides a comprehensive analysis of a test sample's antioxidant activity. Oxygen Radical Absorbance Capacity (ORAC) assay used to measure oxidative stress in exercising human adults (Bloomer, Canale, Blankenship, & Fisher-Wellman, 2010). Bloomer et al. : A 21 day Daniel Fast improves selected biomarkers of antioxidant status and oxidative stress in men and women. Effect of Ambrotose AO® on resting and exercise-induced antioxidant capacity and oxidative stress in healthy adults. Bloomer, Richard J, Canale, Robert E, Blankenship, Megan M, & Fisher-Wellman, Kelsey H 2010. Nutrition journal; 9: 49. Deepshikha Gupta Department of Chemistry, Amity Institute of Applied Sciences, Amity University Uttar Pradesh, Sector 125, Noida-20130, India IJPSR, 2015; Vol. 6(2): 546-566.